This story of the Turkish forced genocide of the Armenians is truly something to behold. The journey follows Mikael, a passionate medical student who is Armenian, Ana, a gorgeous French woman with vast love, and Chris, an American reporter for the Associated Press. The disturbing disruption of their lives is captured on screen during the war which brutally massacred an estimated 500,000 Armenians. The idea that peaceful lives with friendships and romantic relationships can be torn to pieces because of violence had a concrete display in this film. 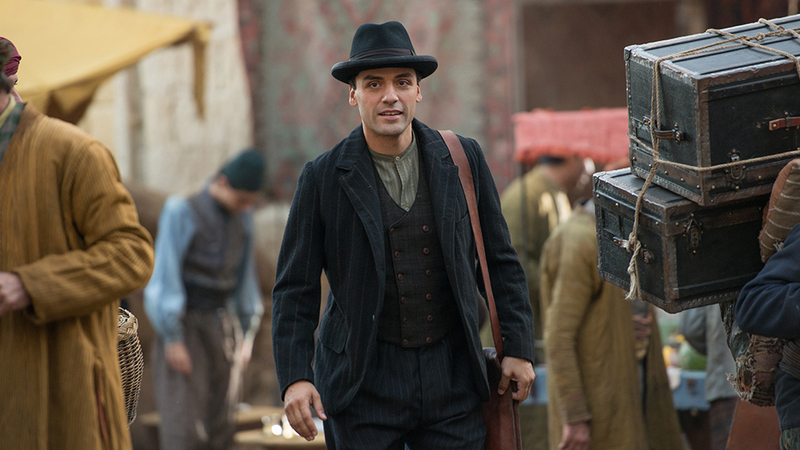 Oscar Isaac brings the gentle being and absolute brilliance to his character of Mikael Boghosian. He is a lover of medicine and wants to better his life in order to help his people with the resources that he has to gain. He is truly a kind human being who remains faithful to his words and actions. There’s a scene where he and his new friend are given a test on a cadaver. His friend accidentally gets feces squirted onto him and faints. Immediately, Mikael takes his friend and makes sure that he is alright. This type of person is what continues to be exuded throughout all of the truly terrifying moments in the story. Ana Khesarian, played in a compassionate way by the fantastic Charlotte Le Bon, is a beautiful woman who cares for the children affected by this war resiliently. She also has a teetering relationship with Chris Myers, who is played with anger and seriousness by Christian Bale. Ana has a beaming quality about her that gives light in the horrifying murders throughout the three’s journey together. A little ways into the movie, she develops a relationship with Mikael even when he is bothered because of his being betrothed to his wife. The Turkish military truly commits heinous crimes in this film and its sinister criminality is exploited to be hated by bounds in this rendition. The hangings of innocent villagers, the shootings of injured men, the brutal beatings of any person, and the mutilation of mothers are nightmares that drive the gross injustice home to the audience. Chris Myers is the one who seeks the dissemination of the truth and for these despicable actions to be rectified. He is almost like the hero of this story as he is the informational source to the world of what is going on in this dark place. Although some may disagree, this is a fine film that educates in an intensely engaging manner on a genocide that should touch all those who see the piece.